As a businessperson, crafting something completely new goes beyond the definition of “writing revisions.” So, I asked the editor if there was budget to compensate for what I considered to be work and time beyond the original scope. The magazine had selected the locations, and the lack of a free photo was beyond my control—and it was their choice, not mine, to not want to pay for one. That’s not the way she saw it. She maintained that this was simply one of the revisions that was indeed covered under our agreement: requesting “additional information.” It quickly became evident that we’d need to agree to disagree; I completed the task without further discussion. I’d had a solid, several-year relationship with the magazine, and it was only about 200 words. A good faith gesture. They’d generally been pretty low maintenance, as far as the revisions required for other writing I’d done for them. Their pay was at the low end of my range, so the financial impact was minimal. The assignments usually required finding the interview resources, which was time consuming. It’s almost always a bummer to lose business. When you’re in conflict with an editor or a client, whether over writing revisions or another issue, it may not be business worth keeping. A hardliner might say I gave in too easily on negotiating, or should simply have said, “No more pay, no more writing.” Others might argue that the editor was in the right, and I shouldn’t have asked for additional compensation. After weighing the pros and cons, writing the small item seemed like the right thing to do. I believe I took the high road. That said, I’m confident that my future time is better spent working with clients whose business principles align with my own. In the comments: Have you ever had a client ask for something that crossed the line from writing revisions into 7 deadly sins of scope creep? How did you handle it? Jake, I think you made the correct decision. I wrote a post year ago or so about a similar situation. I fought for more compensation, but when it looked like the editor wouldn’t give in, and I might not get paid anything, I just did the extra work. I appreciate the support, John–and thanks also for the mention in the Google+ Freelance Writers Community! Please feel free to share your blog link and I’ll add it to my post. Interesting. Thank you! 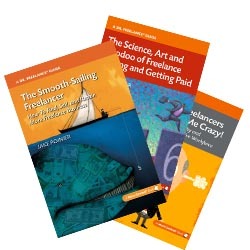 I’m new to freelancing but it sounds to me like you handled the situation perfectly. Welcome to the freelancing world, Natalie! Hi Jake. Interesting timing. While my example is slightly different, it basically concerns the terms of your agreement. A long-time client referred me to a new business partner of theirs. Despite the new client signing off on my Statement of Work, they basically ignored the terms for payment, which include a 50% deposit and a statement that no work starts until the deposit is received. After multiple follow-up, almost two months after I sent the invoice for deposit, they notified me that they have a 45-day cycle for payment. Trust me, my terms for paying the balance do not include a 45-day turnaround. I am still waiting for the deposit and had conducted two, good-faith calls back in June as a courtesy to my long-time client. And the new client wants me to interview the subject matter expert before the deposit is received. I let them know I would complete this project but any future assignments would require a change in terms. I may have shot myself in the foot for future assignments (and the client is huge) but at this stage in my career, it’s not worth the hassle. Thank you for sharing your story, Cathy. How frustrating that this was a referral from a long-time client–usually those are the safest/best kind. Sounds like you handled it 100% appropriately; and you’re right, you need to hit the eject button if someone is consistently ignoring or overriding the terms of the deal to your detriment. You know what they say, “The bough that doesn’t bend is really rich and has the biggest house, so there.” Wait, maybe I got that quote wrong. Freelancing, like all business really, is about relationships—something I think you’ve written about before. So I can definitely see bending in this instance, although the editor was (IMO) wrong. Sadly, it also makes sense that this adjusts your enthusiasm for future projects because, in reacting the way she did, the editor basically showed you exactly how much respect she has for you. She could have at least met you in the middle, to show interest in relationship preservation. Yo, precisely: It is all about relationships, over the long haul. No one will care how great you are at writing/editing/designing if you’re unpleasant to work with. That door swings both ways, of course; in this case, I consider the editor the one who loses–since she doesn’t benefit from my brilliant, lovingly crafted prose anymore, LOL. That is a definitely an uncomfortable position to be in, and I was annoyed on your behalf, although I’m with everyone else in saying you did the right thing. I wonder if the editor was inflexible because print budgets are so tight these days, and she grinded you down because she had penny-pinching higher-ups. I was in a situation similar to Cathy about a year ago, but I actually did the work without a deposit, even though a deposit is in my contracts for large projects. I did get paid three months latter, and they did the right thing by giving a fairly large bonus, so it worked out, more or less. Oh, I’ve had this happen more times than I can count. At first, I’d convince myself that it’s “just one” change, but after countless revisions, I soon learned to avoid the endless changes. That usually cools their jets. Thanks, Mahesh. I assume you’re right, given that the pay rate wasn’t that good to begin with (and the fact that they need free photos). Good to hear about the bonus in your situation–that’s always nice. Lori, I don’t have that many problems with endless revisions, although there is one client who has no problem going to v24 or v25. (We’re on an hourly basis, so I can overlook it.) The “one time” exception is a great idea–smart negotiating! I would have handled this pretty much the same if it had been a long-time client. I would have started by saying the new information was beyond the scope of the original assignment and asked for additional payment, done the nominal extra work if they wouldn’t pay, made sure to fine-tune the language of future assignments so they couldn’t treat such new work as part of the original job – and not made any special effort to pursue new assignments there. Had it been a new client, I’d have pushed harder for additional payment. Thanks for commenting, Ruth. The challenge was that she maintained that the revisions WERE within the scope of the assignment. So, we were at loggerheads. And yes, if they ever contact me in the future, I will clearly define what “revisions” means to me!